As part of the Abigale Hall paperback publication week celebrations, I’m delighted to be able to offer you the chance to win a signed copy of the book. Read on to find out more about the book then click the link to enter the giveaway. The giveaway will be open until midnight on Saturday 23rd April. The winner will be chosen at random by Rafflecopter and will be contacted within 24 hours. On a foggy evening in 1947, seventeen-year-old Eliza and her troubled little sister Rebecca are banished by their aunt and sent to work at an isolated Welsh mansion. But there are rumours of missing maidservants and a ghost that stalks the deserted halls… Wandering through the mansion’s dusty rooms, Eliza finds blood-spattered books, crumpled photographs and portraits of a mysterious woman – clues to a terrible past that might just become Eliza’s future. As Eliza unravels a mystery that has endured for decades, Rebecca falls under the spell of cruel housekeeper Mrs Pollard, who will stop at nothing to keep the house’s secrets. But can the sisters uncover the truth and escape back to London before they meet a dreadful fate? Abigale Hall is published by Black & White Publishing and is available now in paperback and as an e-book. The kindle version is currently only 98p so if you’re not lucky enough to win the signed paperback click here to order. 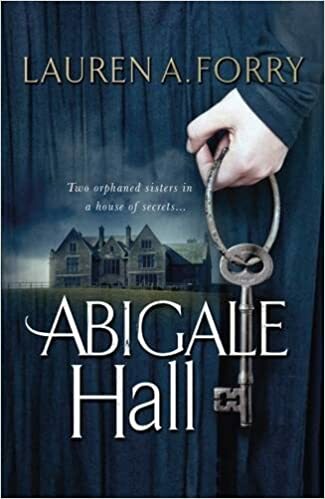 Click here for your chance to win a signed copy of Abigale Hall. Crikey – the spookiest place I’ve ever been was an old farmhouse where I used to babysit. Isolated in a field with two staircases you could hear footsteps travelling between the two sets of stairs and breathing even when there was no-one there! Oh I like spooky places, I’ve visited loads, haunted buildings, woods, old castles, dungeons. Probably the scariest was a castle, I was exploring and had lost my Husband, I walked into a really dark room in one of the towers and from the large fireplace I heard a roar and my Husband jumped down from inside! He had climbed up into the fireplace so was completely hidden and unseen until he dropped down…scared me to death! That would have frightened the life out of me too! The grounds of Haden Hill Hall. We went for a Ghost walk (as you do) and we were all thinking, okay, nothing to report other than I’ll be haunting the place myself soon as I’m slowly freezing to death. On the way out the ‘ghost host’ told us about the beautiful rose garden (just gnarled sticks), where the lady of the house occasionally visited and when she did the most wondrous floral scents filled the air. We nodded politely and as we were walking away that’s exactly what happened. I started to look for someone holding the Febreeze, but no one was there… I suppose it was more unexplained, rather than spooky. Bodmin Moor seems a popular choice! I don’t think I’d be brave enough to go to a ghost vigil! Yes that does sound creepy! This is tough as I’m not easily spooked so I suppose it will have to be an old hotel I worked in Oxfordshire which supposedly had a resident ghost – it was very dark and had dingy nooks and cranies behind the scenes.